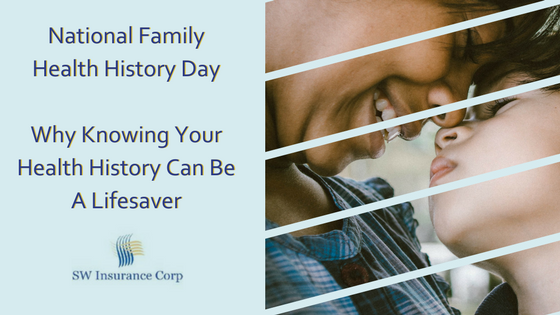 National Family Health History Day – Why Knowing Your Health History Can Be a Lifesaver | SW Insurance Corp.
Thanksgiving gives us the chance to gather together with those we love in the spirit of gratitude and sharing. As we fill our plates and eat our pie, we have the chance to share family stories and pass along our family history. It is because of that strong link to history that in 2004 the Surgeon General, in association with other U.S. health agencies, declared that Thanksgiving would be National Family Health History Day. Subsequent Surgeon Generals have continued to claim Thanksgiving Day as the perfect time to learn more about the health conditions that our families have passed from generation to generation. The purpose of National Family Health History Day is to remind us to take advantage of the opportunity that being with family gives us, to learn more about medical conditions that may run in the family. That way, we can be sure that the information we provide our medical providers is accurate. With complete information, our doctors can help us develop a proactive plan to prevent the diseases that tend to follow our bloodline. The medical community has known for many years that some diseases tend to run in families. And while most of us agree that we should know more about our family health history, most of us never get around to asking about it. In fact, the National Institutes of Health (NIH) reports that 96% of Americans believe that our family history is important even though only 30% have tried to gather the information. Of course, just knowing that you have risk factors for a certain disease doesn’t mean that you will develop it or prevent it. But knowing that members of your family tend to develop certain conditions can help you make lifestyle changes that can help slow down or prevent occurrence. From the doctor’s point of view, having a comprehensive and accurate history can help them determine the best screening schedule for your particular circumstance. If they know what to look for, your doctor can watch for early development of certain symptoms that might otherwise be overlooked, and you’ll have a better idea if you should talk to your doctor about something that might be concerning you. The relatives that we can learn the most from are our closest relatives by blood– grandparents, brothers and sisters, and aunts and uncles. Information such as congenital disabilities, age and cause of death, childhood health problems, and chronic diseases can all give your doctor valuable insights into the best way to help you develop a good health plan. So this year, as you go over the river and through the woods make sure that you keep in mind that you have the perfect opportunity to learn more about yourself and your family. Ask questions, make notes, and share the information with your doctor. You just never know when that information will be put to good use. It may even save your life.